California regulators have unveiled a roadmap that would let consumers begin using self-driving cars, though manufacturers would have to prove the emerging technology is safe before a licensed driver could get chauffeured around town. The approach California's Department of Motor Vehicles offered Wednesday in precedent-setting draft regulations is cautious, though it does allow that Californians could be behind the wheel of a self-driving car by 2017. Among other safety-related requirements, the cars must have a steering wheel, and a licensed driver must be ready to take over if the machine fails. Google, which is pushing to get cars without a steering wheel or pedals to consumers, expressed "grave disappointment" with the rules, which the tech giant said would slow deployment of technology with huge life-saving potential. Though no manufacturer has said it thinks the cars are ready just yet, at least a dozen are developing the technology. Google has suggested a model could be ready for limited use sooner than the public expects. In September, the safety chief of its self-driving car project, Ron Medford, said the technology is "close to working pretty damn well." California's go-slow approach could benefit Texas, which this summer emerged as a competitor in the deployment of self-driving cars when officials in the capital city of Austin welcomed Google prototypes for company-sponsored testing. "Given the potential risks associated with deployment of such a new technology, DMV believes that manufacturers need to obtain more experience in testing driverless vehicles on public roads prior to making this technology available to the general public," the agency said in a written summary of its draft regulations. Those draft rules set out how the DMV wants to move beyond the current small-scale testing of prototypes on public roads. The DMV can change the rules over the coming months before they are finalized, and the industry is sure to lobby for significant changes. That process will further delay rules that were due at the start of 2015. Under California's framework, manufacturers would receive a permit for three years, during which time consumers could lease the cars but manufacturers would be required to keep tabs on how safely they are driving and report that performance to the state. Before the DMV grants that three-year permit, an independent certifier would need to verify a manufacturer's safety assurances. Google and traditional automakers advocated for manufacturer self-certification of safety, the standard for other cars. Drivers would need special, manufacturer-provided training, then get a special certification on their licenses. If a car breaks the law, the driver would be responsible. Though the timeline for public access is squishy, in principle the DMV could finalize the rules and a manufacturer could satisfy the safety requirements as early as 2017. That said, the draft rules surely will postpone the technology's rollout in California. "This points to a very long slog ahead for not just Google, but really other automakers as well," said Bryant Walker Smith, a law professor at the University of South Carolina who studies self-driving car regulation. He added: "California's proposed rules are fantastic news for Texas." Austin's mayoral spokesman Jason Stanford said his city's government already believes self-driving cars are "legal and safe" and is "thrilled to host innovative ideas like this." California's DMV has said it wanted regulations to protect public safety, but not be so onerous that they would stifle development of a technology that could prove safer than human drivers. After all, cars that can safely drive themselves under all conditions wouldn't rely on drivers who may be drowsy, distracted, buzzed—or unable to drive because of their age or a disability. Boosters say the technology could prevent many of the more than 32,000 deaths on U.S. roads each year. The cars use a suite of sensors—including radar, lasers and cameras—and onboard computers to drive. Eleven companies already have permission to test on California's public roads, with Ford the latest addition. 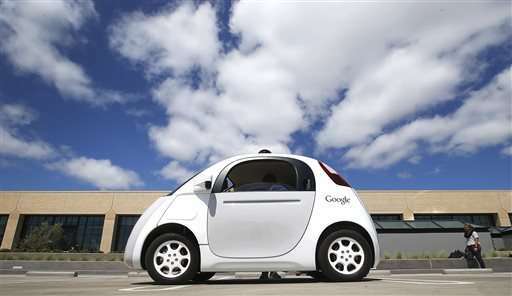 There have been scattered collisions, nearly all involving Google cars. Those collisions have been minor, and the tech giants says each has been caused by drivers of other cars. Google spokesman Johnny Luu said the company was "gravely disappointed" by the draft regulations. "Safety is our highest priority and primary motivator as we do this," he said in a written statement. The Alliance of Automobile Manufacturers industry group was not publicly critical, perhaps because traditional automakers the group represents are phasing in features such as automatic braking and cruise control that adjusts to the speed of other vehicles—instead of jumping to a car that drives itself, as Google envisions. Meanwhile, a consumer group applauded the draft rules as appropriately cautious. The DMV "did exactly what they should do, which is put the public safety first," said John Simpson, privacy project director at Consumer Watchdog and frequent Google critic. Google is arguing against this? California is doing them a favor. Without a "driver" they'd be the driver and they'd be liable for every accident their cars were at fault in. It completely screws up the financial relationship and business model required to make and sell driverless cars. This "solution" is bad but it would also save what is left of the economy...for the moment. Driverless vehicles would surely destroy so many jobs that they really do have that power, no exaggeration required. In most US states, and in most countries, the most common job is truck driver. Replacing drivers with robo-drivers would remove an enormous amount of wages from an enormous amount of people. Thus, replacing human drivers with robo-drivers would be way more than enough to destroy a huge number of other jobs that depend on consumer spending by chain reaction, and it would happen world-wide. Only until Hyperloops will be commonplace. There's a rumor going round that Google is actively censoring an interview of one of its former employees from youtube, where he mentions an incident with a Google car driving through a canyon pass and mistaking an oncoming truck for the canyon wall, mis-interpreting its position on the road, and subsequently trying to steer down the cliff with the driver struggling to take the wheel. We recently had some minor flooding in the Portland area, and I watched news scenes of police and others directing drivers to turn around and drive back the wrong way on a one way street. How would the Google car without manual controls deal with a situation like that? It is not practical to sell a self driving car that you have to sit behind the wheel. It will be frustrating and the temptation to take over will out weigh any benefits. It will create more problems then it is intended to solve. Oh hell no, keep your Grand Theft Auto C++ written by a code farm NPC nightmare car, thank you very much. These things are going to be hilariously awful for the first 20 years. Consumers have no idea how a little bug can fail to impact the code execution until it does, then it all goes right to hell under unique conditions they may then fail to reproduce, thus solve, for several versions. This will happen over and over. This is treating a car like a robot, it's not safe to place your life in an algorithm you can't override. Well, in theory, Google would have mapped the area under normal circumstances and plotted out driving paths for other routes. The car would call home and ask for assistance from the database, and the database would try to compute a detour by combining parts of the other paths, upload a new path description into the car, and the car would then attempt to drive it. The problem of such ad-hoc paths would then be that the central controller doesn't necessarily know how to make the path safe. For example, turning two crossing paths into a right turn by interpolating a curve between the two might cause the car to clip the curb - or stop dead when it reaches the spot because the path is "obstructed". The idea of the Google car is - or seems to be - that Google would have eventually mapped every road in town with path descriptions around every corner as if someone had painted a virtual line on every bit of road around every corner for the robot to follow - and then all the robot has to do is switch between following different lines. So it's much like a virtual tram line or trolley bus. The car takes every turn as programmed - deviating from the precisely pre-defined path only to avoid obstacles that it detects - or stopping if it gets confused. As long as Google can keep the map and path descriptions updated in real time by the cars driving around and scanning for new data, the system should work at least adequately. If there's a sudden change in the layout of the streets, like a car crash, the first Google car that gets to the scene is supposed to report back home that the road is blocked. Someone may hack them to run over crowds! Has the insurance industry weighed in on this? Obviously driver or driverless, you need insurance to operate on public roads. 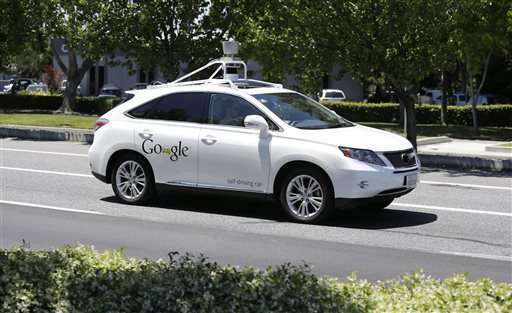 Are you able to get insurance for the driverless cars? For as much hate as there may be for insurance corps, it is they that have the greatest understanding of risk assessment.